This Group if for those interested in Selling Buying and collecting all style of drinkware including German Steins! Started by Big T. Last reply by AC Silver Antiques Jun 30, 2016. Started by Ellene Meece. Last reply by Kent Richards Dec 14, 2014. Started by Amy Rogers Mar 24, 2012. Started by Lillian Dunbar Sep 12, 2011. Started by Barbara Ann Willis. Last reply by Barbara Ann Willis Jun 17, 2011. Started by EndOfMyLine Mar 7, 2011. New Beer, Wine, and Liqour Group!! Started by Chicago Retro Jul 29, 2010. Started by Samantha Davis Feb 12, 2010. Started by Your Bounty, Bernie Oct 1, 2009. Started by ray simpson. Last reply by Your Bounty, Bernie Sep 1, 2009. You need to be a member of Drinkware & Steins! to add comments! Hey! I am a collector of many kinds and types of steins. I joined this group because my collections are mostly other styles of drinkware other than German but a few German made are in my collection. Mostly I collect beer steins, tankards and glasses, however my pewter collection is quite extensive as well. Glass, pewter, ceramic, engraved, hand painted, machine finished, pewter lidded, footed and some as old as our country. If its for drinking beer, ale or lager, I find them and collect them. Many duplicates to trade as well. S Cooper, thanks for posting these Catskill steins. 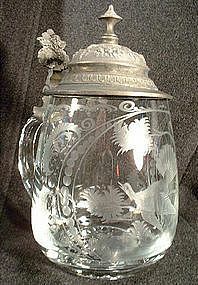 Catskill Mountains (Stony Clove Notch), German made Souvenir Stein, circa 1910. .5 L.
This group makes it to the front page every now and then. Wish we had more activity and a moderator.